I knew this would happen; I build up a head of steam about something big, have too many things to say about it in too little time, stop to think a while, and while thinking, life takes over. 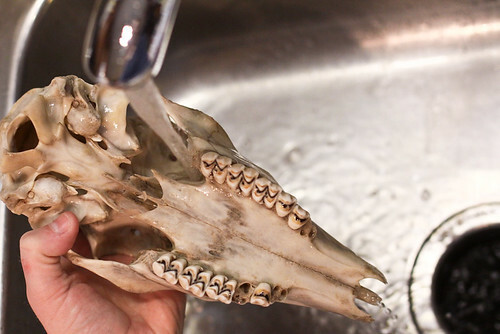 And so here I am, washing a skull in my sink, and not writing about Esfuerzo. I promise I'll get back to Esfuerzo soonish. But right now, I'm knee-deep in learning whitetail deer anatomy, examining dentition, finally understanding nasal conchae. 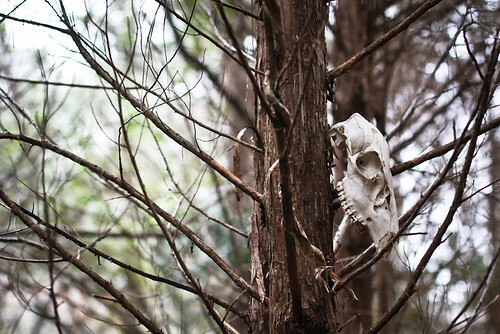 This skull came from Larus Park, where a friend and I found it hanging on a tree. A find like this is too much for me to pass up. It must be examined, shared. But as with everything else, it has to pass my ethics review. While I typically adhere to the "take only pictures, leave only footprints" axiom, the fact is that some elements of nature do end up being removed for educational purposes by rangers, geologists, biologists, and the like. When should something be left behind, and when is it ok to remove it? In this case, the skull was not in a National or State Park, it is not an essential part of the ecology, and it is not rare/endangered. My intents were educational, for both personal and school use (I have already discussed it with both the school director and the art teacher). I decided that the benefits outweighed the costs, and I headed back to pick it up. Our initial assumption was that the skull, which is missing the mandible, belonged to a deer. Examination and comparison to images of other whitetail deer skulls confirmed this. A taxidermy review suggested that a peroxide soak would be best for cleaning/bleaching the bones. This removed loose debris and also made me feel like the bones were less likely to harbor contagion, although honestly, this skull is old enough that it probably hosts nothing more than the average rock or stick would. Dan pointed out the issue of prion disease, but without actually consuming venison, I'm not convinced there's much risk. I'm maintaining handwashing protocols, though. The peroxide didn't do much to improve the appearance of the bones. 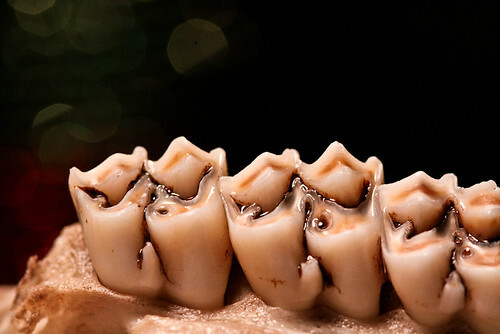 The teeth were especially bad. I set to work with dish soap, Barkeeper's Friend (oxalic acid), a toothbrush, a safety pin, and a sewing needle. The teeth look better, if still somewhat less than gorgeous, and I have a newfound appreciation for the work of dental hygienists. I'm also reminded that I need to schedule cleanings for my family. I also have a new appreciation of nasal anatomy. This is a view from the anterior aspect of the nose, looking up through the nasal cavity. 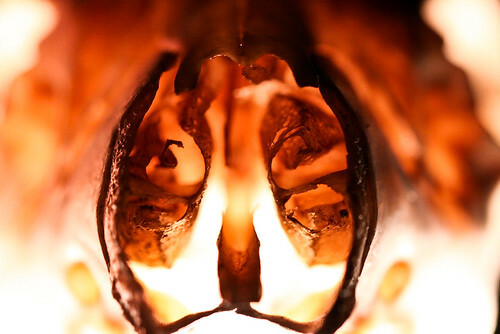 The skull is lit from beneath/within by a desk lamp. 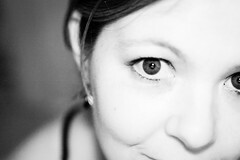 At midline is the septum. The turbinates curling on either side are the conchae. I've never been able to picture this when looking at sagittal sections of human conchae. He was pretty cold and slow when I discovered him yesterday, and died overnight. I've tentatively identified him as a juniper stinkbug, Banasa euchlora. It's worth noting that the tree in the first picture of this post is a Virginia cedar, Juniperus virginiana. 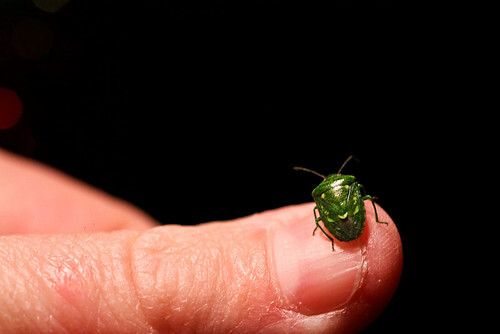 You can also get another glimpse of the stinkbug here, at my new 365 project.